In a business era in which executives are taken away in handcuffs and corporate malfeasance and scandal dominates the business headlines, there is tremendous value in the stories of ethical companies and spiritual business leaders. The CEO and the Monk is one such compelling story, the story of KeySpan, the nation?s fifth largest energy giant and a profitable, Fortune 500 company, and the two KeySpan executives?one a former monk?whose unique working relationship is based on something as simple and powerful as "doing the right thing." This isn?t yet another prescriptive business guide written by breathless consultants. It is a story about a real business and how two unusual and dedicated humanists can keep their eyes on profits and ethics at the same time. Robert B. CATELL is the CEO of KeySpan, one of the nations largest energy providers. He is one of the most highly respected business leaders in New York. 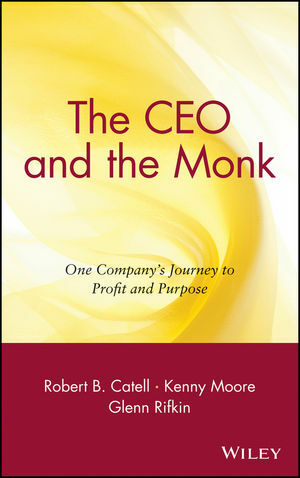 KENNY MOORE is a former monk who left the religious life for a successful career in human resources. He is currently Corporate Ombudsman at KeySpan. GLENN RIFKIN is a veteran business journalist who has written extensively for the New York Times and coauthored many groundbreaking business books, including the Wiley title Radical Marketing, The CEO Chronicles, and The Ultimate Entrepreneur. Introduction: What Is Good for the Soul Is Also Good for Business. Chapter One: The Corporate Funeral. Chapter Two: Brooklyn Union, the Fertile Hen. Chapter Four: The LILCO Deal. Chapter Seven: The New Millennium. Chapter Nine: Preserving the Corporate Goodness. Epilogue: The CEO; The Monk.